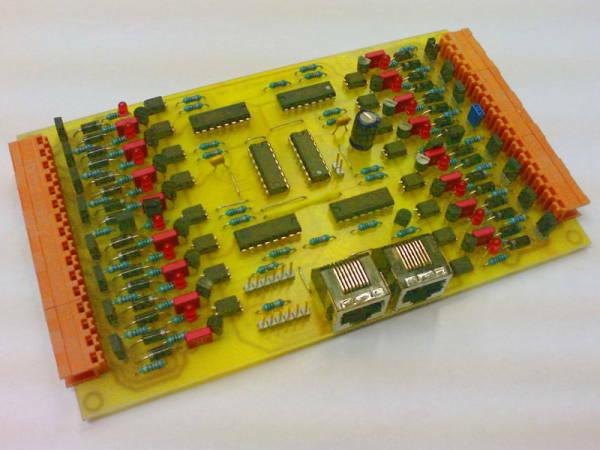 ORF-1 is a current sense S88 feedback unit for use with many systems, including ORD-1. This do-it-yourself (DIY) sensor module helps you to detect your trains (or switches or any sensor) to run your layout in auto mode. It is larger then the most commercial sensor modules, but it has opto isolation, twice as much inputs and mode selectors for all of them. You can also use it in a multi booster area: up to four boosters are supported by this unique module. Four groups for power separation. 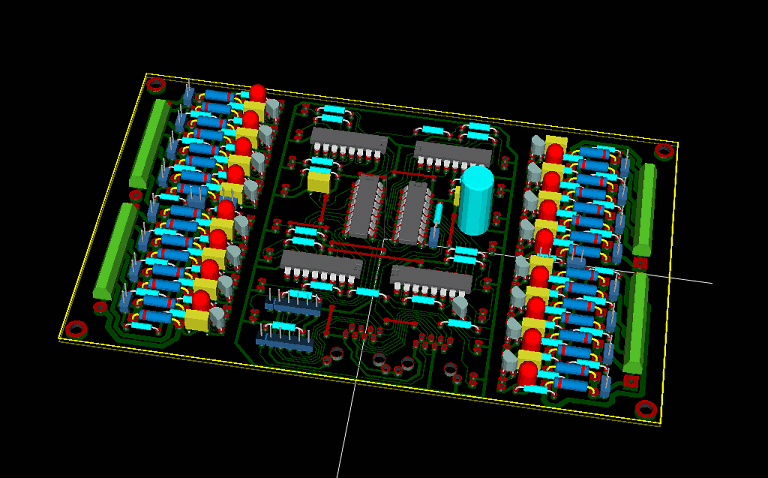 Possible to use detachable terminal blocks, preferably in 4 or 8 terminals per block. Supports S88-N with shielded RJ45 connectors. Use cheap shielded network cable for module interconnection. Changes: R67 pull down. Better silk screen layout. Status: Several units built. Works fine. Rectifier diodes: The diodes must sustain full power usage and short circuit currents. You may try 1N5401 series (1N5406). Jumpers/Shorting links: The removable shorting links must sustain full power usage. Choose type specified for at least 3A current. Terminal blocks: Use any type with 200mil=5,08mm spacing. Useful, but not necessary, features are: 1-8 numbered terminals and/or removable terminal blocks. Bulk capacitor: If you have many modules daisy-chained, you may reduce the 100uF capacitor to a smaller value (like 10uF or 4,7uF). Mount all small (low) components and jumpers first. Please note the polarity/direction for diodes (the ring side in the square pad), LEDs (the long leg in the square pad) and electrolytic capacitors (the minus sign in the round pad). With J17 and J18 you can shorten the Booster power/ground Connectors of K1 and K2. J19 and J20 does the same with K3 and K4. ORF-1 has 4 separated Booster inputs, one for each connector group ( K1 - K4 ). With the jumpers you are able to combine 2 connector groups. This can be also done with wires but the jumpers offers more comfort. If all the 4 jumpers are closed you receive 2 groups with 8 inputs powered by two boosters. 1 Booster: Close J17, J18, J19 and J20. Connect K1 and K3 with Booster A. 2 Boosters: Close J17, J18, J19 and J20. Connect K1 with Booster A and K3 with Booster B. 4 Boosters: Open J17, J18, J19 and J20. Connect K1 with Booster A, K2 with Booster B, K3 with Booster C and K4 with Booster D.
Overview of how to set jumpers with 1, 2, 3, or 4 Boosters. With these jumpers you can change the mode of each input from Sensor to switch. If you close the Jumper the Input acts as a current sensor. If you open the Jumper the input is active if you shorten it to ground with a switch (e.g. reed switch). "Forward" mode is described above. If the Sensor mode Jumper is open, the sensor is active if it is shorten to ground, e.g. with a reed switch or so. If the Sensor mode Jumper is closed, the sensor provides Power to the track. It acts as a power output. The used current is measured. The sensor is able to detect 2mA. "Reverse" mode is turned around. You have to change the Booster common and the Booster power inputs. If you do this the behavior of the sensor is as follows: If the Sensor mode Jumper is open, the sensor is active if it is shorten to Booster Power. If the Sensor mode Jumper is closed, the sensor acts as a power input. The Sensor is active if the current is more than 2mA. In Both modes the current sensors are active if you connect a 10kOhm resistor or less. You can choose "Forward" or "Reverse" mode for each individual connector group. You can also choose the sensor mode for each individual sensor, no matter if it is in reverse or forward mode. This behavior makes ORF-1 to one of the most multi-purpose S88 Sensor cards. 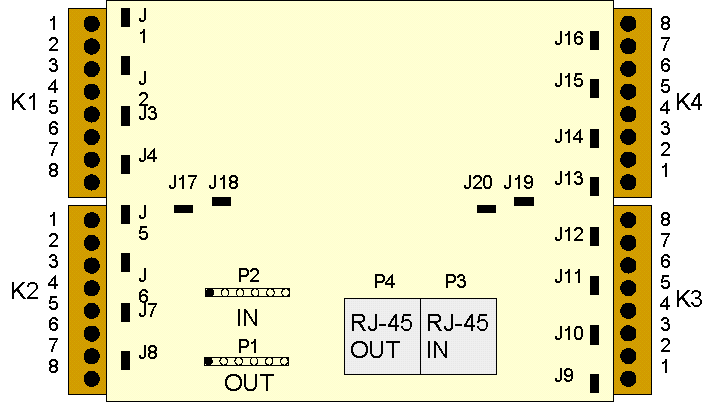 This is an optional and experimental termination for the clock line, used only on the last card in the chain. It may reduce ringing on the clock signal. If you are unsure how to connect after reading the drawing feel free to ask the RUG.